I got 2lbs. of cucumbers in the CSA and decided to experiment and make refrigerator pickles. I based these pickles on my recipe for pickled onions and it worked! The pickles are crispy and sweet and sour at the same time. Yet another food item I will be making myself from now on! These pickles were great after 5 hours and even better after 5 days! Clean the cucumbers and slice them into rounds. Place them into a bowl and sprinkle with salt. Let them sit for 45 minutes tossing occasionally. Pour them into a strainer to drain the excess water. 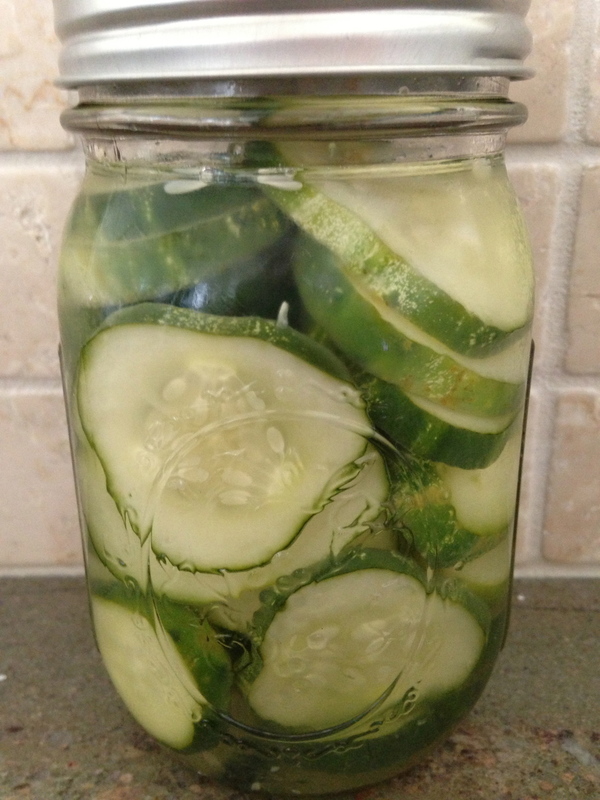 Place the cucumbers into a clean mason jar (I used a 300ml Ball mason jar) and refrigerate for at least 8 hours. Eat on sandwiches or with ice cream. Enjoy!